The founding argument of this book is stated on the first page: “(The author) is obliged to take literary connections into account…” Why is he obliged to do so? Because: “English filming turns out to have a great deal to do with writing” (p.vii). This sounds suspiciously like an argument against rather than for English cinema, but this is, in fact, not the case. Professor Hunter describes his work as “a history of interrelatedness” (p.279). The purpose of the book then is to rehabilitate the idea that it is not a failure of creativity for a cinematic work to be praised for its literary connections. In order to do so Hunter has also rehabilitated another idea: that “formalist appreciation” otherwise known as an aesthetic approach to film is desirable (p.3). So for all you anti-formalists out there, this is not the book for you. 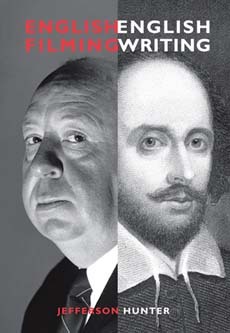 Although Hitchcock and Shakespeare feature on the cover of the book, neither man plays more than a supporting role in the work. We are dealing here with names such as Michael Powell, J. B. Priestley, Noël Coward and Alan Bennett. We should also note that Hunter refers to ‘English’ cinema, not ‘British’ because the works he refers to were “produced in England rather than Scotland or Wales” (p.vii). It is a work very much engaged in English culture of the middle, or as Hunter describes it: “elemental qualities of English culture—its distinctive regard for the past, the pleasure it takes in continuities and reworkings…” (p.11). This is a book which acknowledges and allows a connection between cinema and the arts that preceded it; that the ‘Englishness’ of the English cinema is related to the ‘Englishness’ of other English art. There are four major chapters in the work each of which deals with a separate mode of interconnectedness. The first chapter analyses a form of culture which may best be described as ‘folk culture.’ In it Hunter compares the Powell and Pressburger film A Canterbury Tale (UK 1944) not with its Chaucerian archetype, but with that peculiarly English art form ‘the village pageant’. He then links both to the documentaries of Humphrey Jennings. He demonstrates that the filmmakers in their connectedness to other arts contribute to the idea of Englishness. The second chapter focuses on the notion of crime in English cinema. Although it at first appears that Hunter intends to continue on from the war with an examination of 1940s crime films, his major focus is the Dennis Potter television work The Singing Detective (UK 1986). His argument is that the crime film, which has a claim to being an American invention, can be adapted culturally by filmmakers to be peculiarly of their own culture. Thus in this chapter it is a matter of taking the connection, the inevitable connection, with Hollywood and, if not severing it completely then at least defining the difference. As Hunter writes: “the subject of this chapter (is) how English filmmaking has felt the threat of derivativeness and responded to it, how in a range of screen works…the contest between the home-produced article and the glamorous import has been played out” (p.98). Derivativeness is again to the fore in the third chapter which takes on the vexed question of adaptation. The chapter is evenly divided between the subject of how to adapt Dickens (or more exactly how not to adapt Dickens) and the problematic nature of the Merchant-Ivory tradition of ‘heritage’ cinema. In contending with the established ideas relating to the latter, Hunter is perhaps most engaged with certain biases he has identified in what could be considered orthodox writing about the latter. He identifies an “anti-formalist bias” and an “anti-historical leaning” (p.195). He writes in defence of these works in a significant way. He asserts that the team of Ismail Merchant and James Ivory, especially in their film of The Remains of the Day (UK/USA 1992), have made “a joint effort in defining a certain kind of Englishness from the outside” (p.189). This statement could equally be applied to Professor Hunter himself. His primary point is that the great English literary tradition could not help but be incorporated into a peculiarly English cinema; but of equal moment is the connectedness of the two, the way in which cinema continues the tradition of Englishness which had been long established in literature. The fourth chapter departs somewhat from the focus of the previous chapters. Hunter’s focus has until now been primarily literary, but in this chapter he addresses the question of the function of music in popular English film. The title of the chapter, ‘The Strange Potencies of Cheap music,’ is a reference to a line from the Noël Coward play Private Lives: ‘Strange how potent cheap music is.’ The music analysed in the chapter ranges from Rachmaninoff (sic), through Gracie Fields’ pop songs of the 1930s to the intertwined melodies of the films of Terence Davies and the lip-synced plays of Dennis Potter. Along the way there are divergences to T. S. Eliot and J.B. Priestley. His argument is that the music is as much a form of character articulation as words and mise-en scène. It is a particularly welcome section of the book as the role of music in the aesthetic of films is a topic which has been little examined. This chapter above all brings the reader to new ways of considering the many elements that make meaning in a film. Ultimately, what is most valuable in this book is its steady avoidance of any ideological browbeating. The films he analyses are for the most part, those described as ‘middlebrow’. He is revealing the ways of meaning of English cinema, and for the most part that means the cinema of the middle class. To have the courage to do that without belittling this cinema is something to be welcomed. I recommend this book to all those who take pleasure in cinema; I prescribe it to those who need to learn how to write about the aesthetics of cinema, not the ideology of culture.